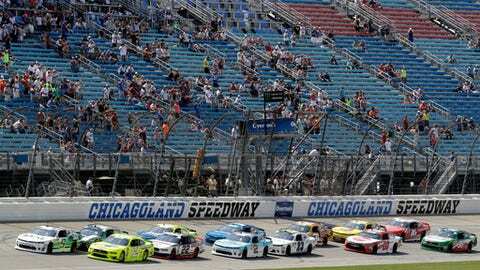 JOLIET, Ill. (AP) Kyle Busch and Kyle Larson raced all over the track during an electric final lap. As Busch began to celebrate his dramatic victory, Larson gave him a thumb’s up. It was quite a finish, and they knew it. Busch outdueled Larson down the stretch Sunday in the NASCAR Cup Series race at Chicagoland Speedway, earning his fifth victory of the season. Busch moved into the lead on a restart with 58 laps to go, replacing Kevin Harvick at the front of the field. Busch, Harvick and Martin Truex Jr. – NASCAR’s top three teams so far this season – were up front with about 40 laps left before a hard-charging Larson crashed the party. He powered by Harvick to get into second. He appeared to be in trouble after brushing the wall with seven laps left, but he kept going and Busch was slowed by a couple lapped cars at the back of the field. Busch and Larson then were neck-and-neck on the final lap. Larson bumped into the back of Busch’s car and moved into the lead. Busch then raced into the back of Larson’s car and sped ahead for the victory. Busch was booed by the crowd when he got out of his No. 18 Joe Gibbs Racing Toyota. He playfully rubbed his left eye in a crying motion and waved off the jeering fans. Larson, who was trying for a weekend sweep after winning the Xfinity Series race Saturday, had no complaints. ”I roughed him up. He roughed me up. That’s racing,” he said. It was Busch’s second win at Chicagoland, joining his victory in 2008. He also moved into a tie with Herb Thomas for 14th on the Cup Series’ career wins list with 48. With NASCAR heading to Daytona this week, Busch and Harvick are tied for the series lead in wins. It’s just the fourth time in series history that two drivers won at least five times in the first 17 races of the season, joining Denny Hamlin and Jimmie Johnson in 2010 and Richard Petty and Cale Yarborough in 1974 and 1977. Busch leads the standings by 62 points over Harvick, who finished third for his 11th top-10 result in 18 races on the 1.5-mile oval in the Chicago suburbs. Truex was fourth, falling short in his bid for a third straight win at the track. Aric Almirola led a race-high 70 laps – he led 40 laps in the previous five seasons combined – but he had to pit twice for loose wheels. He finished 25th. The temperature was in the 90s for much of the day, creating difficult conditions in the cars. The drivers cooled down with bags of ice and bottles of water at pit stops. The conditions on the track changed as a storm front moved into the area toward the end of the race, with the wind picking up and clouds filling the sky. But the rain held off until after the compelling conclusion.